Everything is new and shiny even after 2.5 years of production. We were warmly welcomed and were guided through the distillery, were given time to check everything and with lots of patience while taking pictures (I like that ‘feature’ in tours!). As we were late, we arrived just when the end of day activities started, with the staff preparing for the next day distillation cycle. 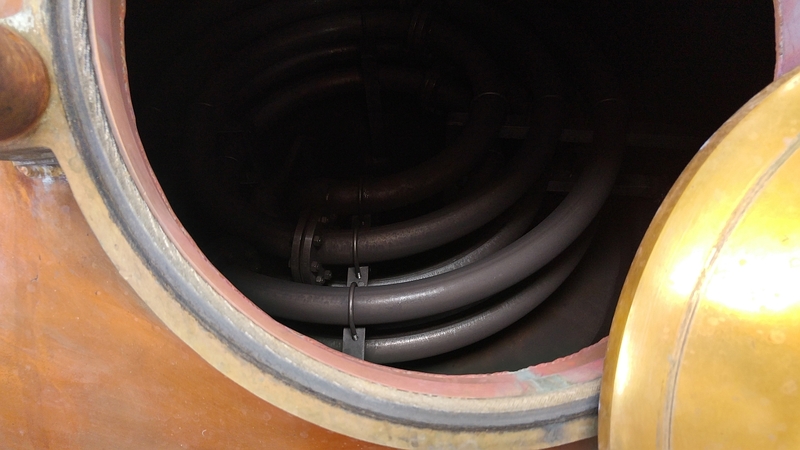 That gave us the opportunity to see the innards of the still, showing the steam coils in all their glory. If you had looked at the Panorama picture, you probably noticed something is missing. Right, no casks! in fact, the spirit is pumped from the hangar to the adjunct hangar which serves as a warehouse and there the casks are filled. As the warehouse is full, the full casks are then rolled to the 3rd hangar (A.K.A the second warehouse). I wondered (worryingly) if there’s enough space in those warehouses for their future casks and they assured me that they have enough space to expand and build 2 more warehouses. In fact, they can even double the distillery capacity (doubling everything in the first hangar)! Average spirit ABV from the distillation process is 69% (as the heart they cut in the distillation process starts at 74% and ends at 62%). Then it’s diluted to 63.5% before filling the casks. In 2014 Wolfburn started producing peated spirit. It’s a lightly peated spriit at 10 ppm and I’m so happy as love peated whisky! The annual/regular bottling will probably be shipped April/May 2016 and the plan is for 60,000 bottles a year. Then we went back to the main hangar and proceeded into tasting a quite mature spirit and the peated new make. Nose: Robust nose, bold and solid oily and vanilla foundation. Salty and with sweet fruits behind a very thin curtain. Palate: Oh it’s quite spicy, vanilla, honey, oak, retaining the oily note and get salty towards the end. Finish: Short finish with oak, vanilla and a dash of honey. The length was disappointing but it’s pretty good. Thoughts: It’s pretty much ready for a release. Can’t wait till 2016! What a small and lovely distillery. I’m eagerly waiting for their official bottlings! Hi Yoav, I assume that the first bottlings from the Quarter Casks are Ex-Bourbon and/or Virgin oak? No ex-sherry influence. (At least that’s what your tasting notes implied). I produce a list of non sherry/wine/port influenced single malts so it’s important for me t know. Interesting that you talk about it being peaty. At 10 ppm I would normaly not consider whisky to have a particulary peaty flavour although there will obviously be some influence. 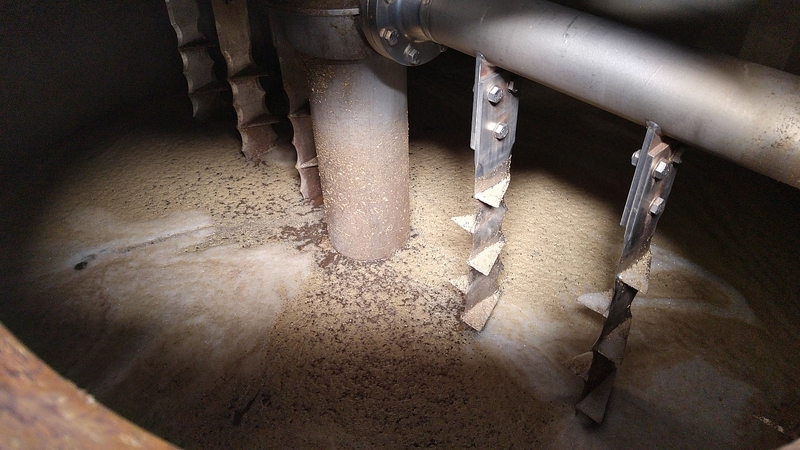 Ardmore peats their barley at around 12 to 15 ppm but I believe that they continue taking more towards the faints (which holds more peat ihttp://rebmordechaireviews.blogspot.co.il/nfluence). Ardbeg also has a long distilling process from the middle cut onwards which is why people describe it as more peaty even though it’s 40-45 ppm than a whisky at 50 ppm or higher. I have demonstrated this by giving a group a glass of Bruichladdich Octomore (between 167 and 200+ ppm) and a glass of Ardbeg 10 (40-45 ppm) and in every case they say that the Arbeg is more peaty. The inaugural release will be without sherry influence. I do not know what casks will be used for the regular bottles. I can only assume it will be mostly ex-bourbon/QC.